Every girls and women hearts tend to flutter when they receive cute little gifts from their special someone. Flowers, hearts, stars resemble love in women's heart. 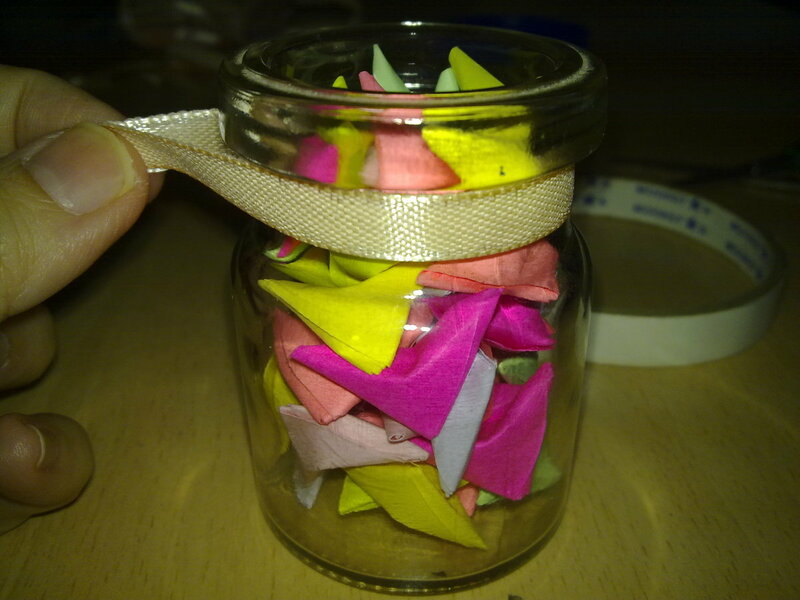 I had seen my friends folding little starts, hearts and paper bird crane and stuffed them into a small bottle or big bottle to make them as a gift for their special someone. 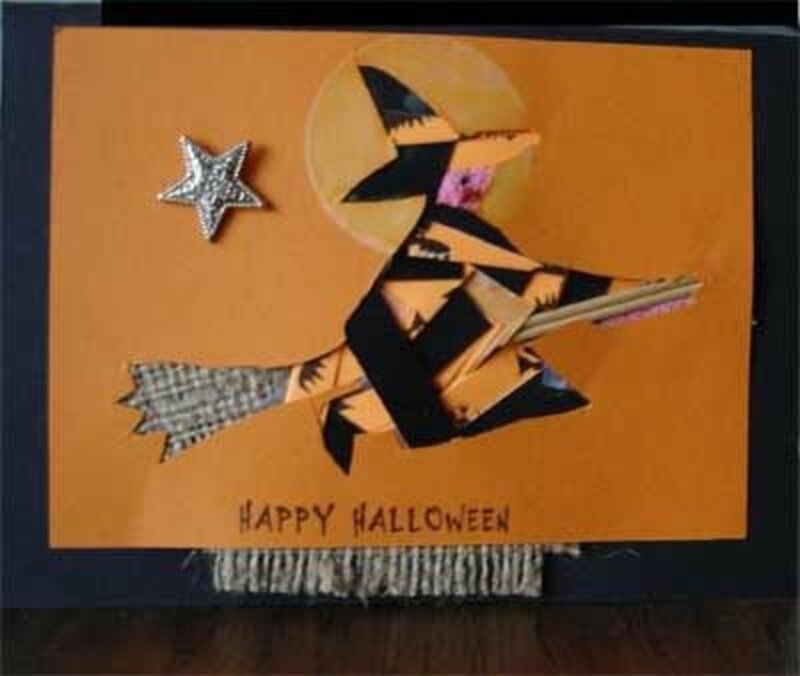 I have to admit that these cute little paper folding techniques can easily win over any girls and women hearts because these special gifts cannot be bought. They are self handmade which require time and effort. That is why female companions usually appreciate the male partner efforts they had put in. Mini paper hearts are great for any occasion such as Christmas, Valentine's Day, Birthdays, just to name a few. 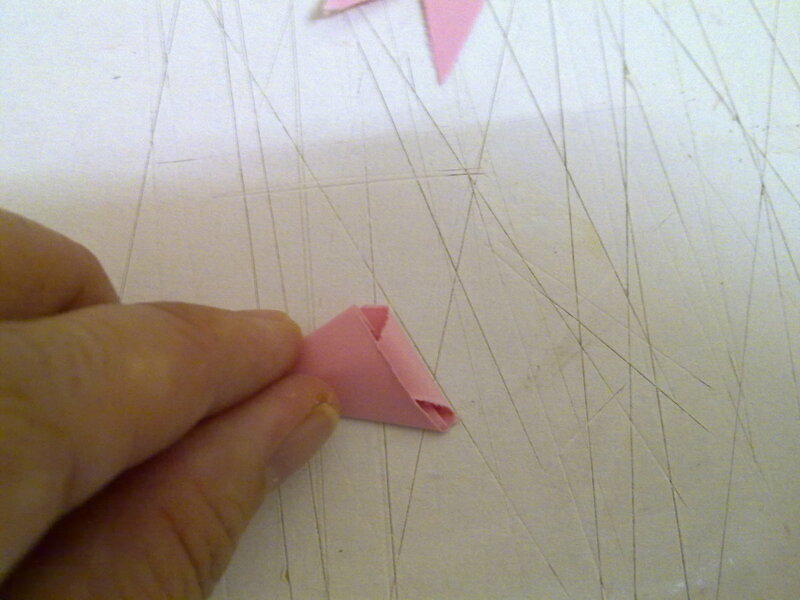 Have you ever try folding paper hearts? 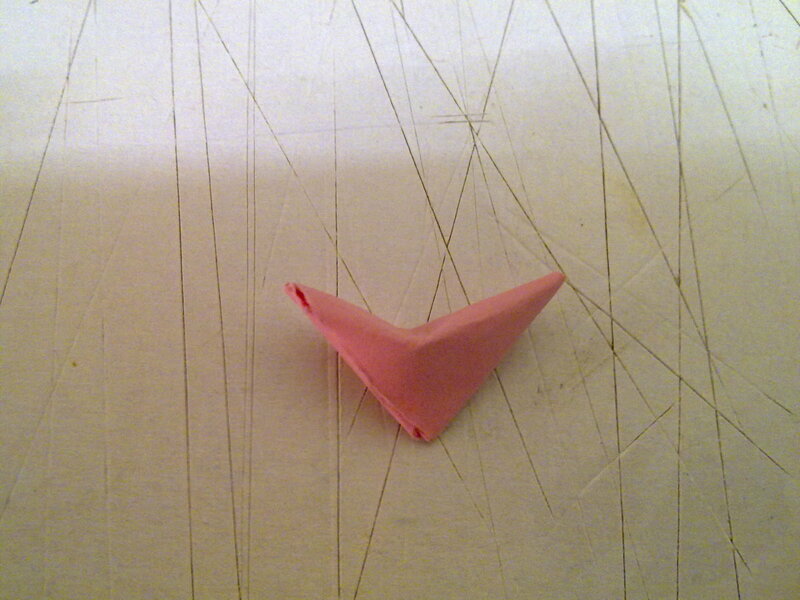 I asked my friend to teach me how to fold Mini Paper Hearts as I find them much easier to fold compare to the other two. 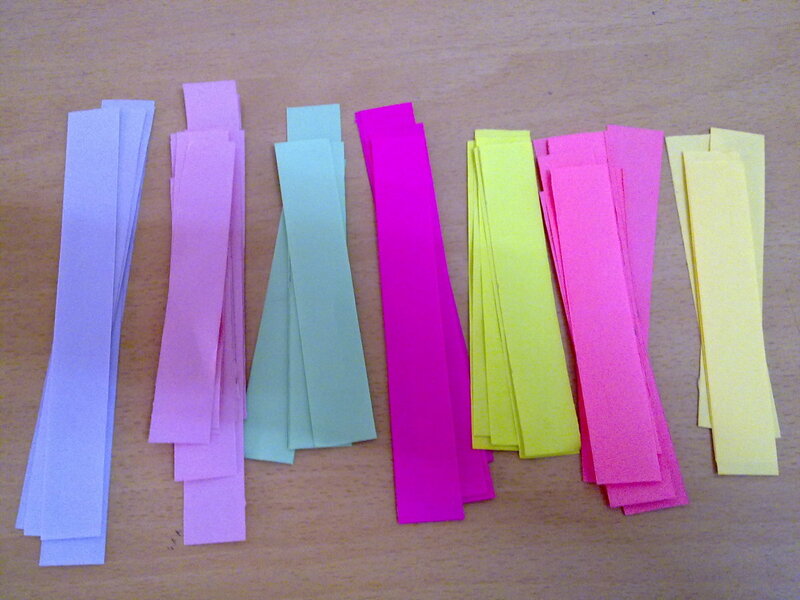 Since Mini paper Hearts require less folding instructions, it was a breeze to complete 99 pieces in an hour. 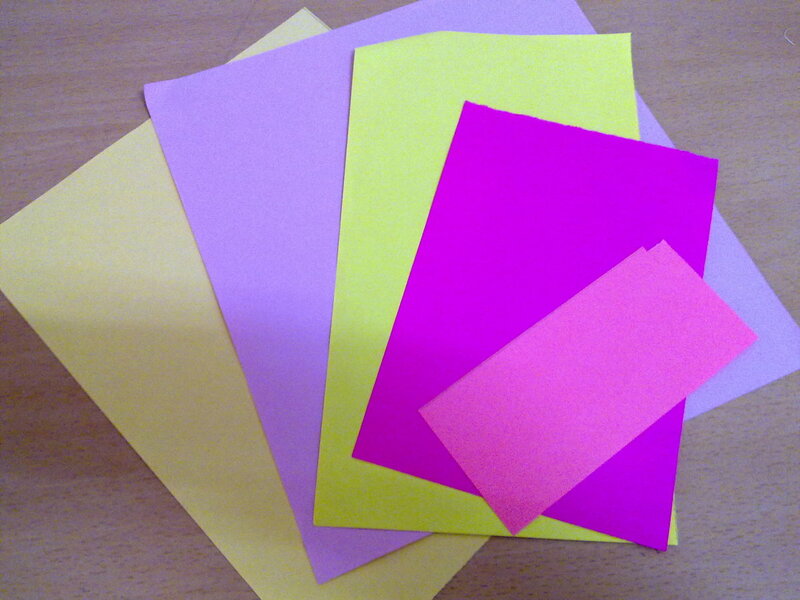 You could choose wrapping paper of different designs of fluorescent color papers to brighten up the hearts. 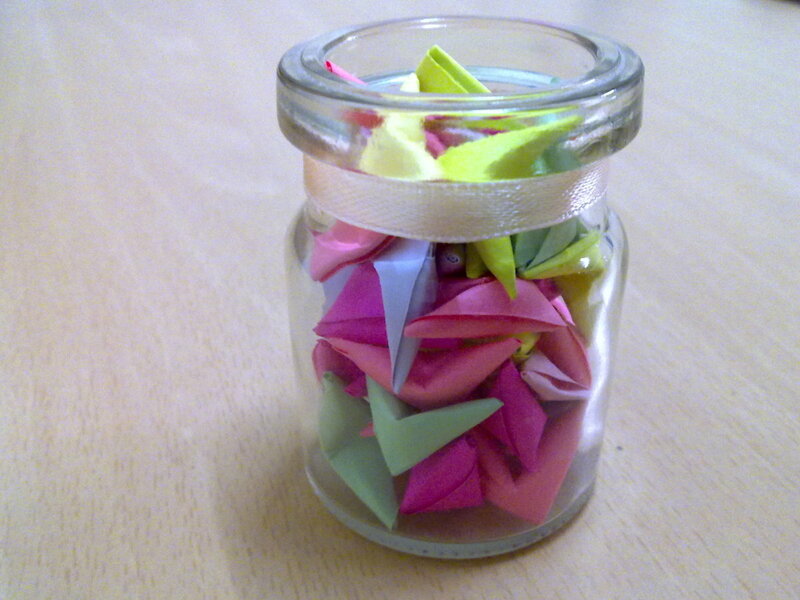 After folding the hearts, put all the mini paper hearts into a small or big clear glass bottle and tie it with a ribbon. Do not use dark color bottles because spouse, girlfriend or nieces could not see what is inside the glass bottle. Any beverage bottle drinks or beer bottle could do the trick. 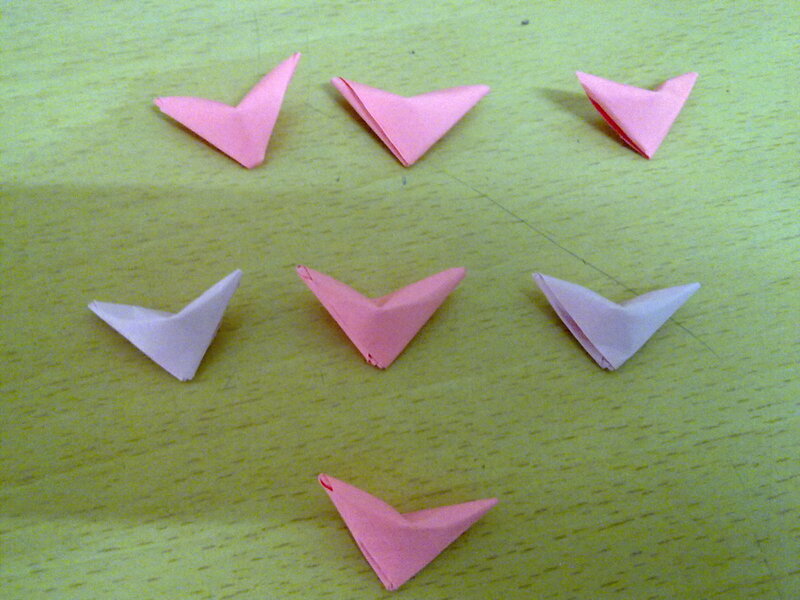 As for me, I used a small health drink bottle which is clear to see and what;s more, I just had to fold thirty of these hearts in a short time to fill up the bottle. You could wrap up the bottle with the mini paper hearts in transparent plastic gift wrapper , complete with a bow tie. It would definitely make your girlfriend's and spouse's heart skip a beat for sure ! Do not look down on these mini paper hearts because these cute papers are souvenirs to be show-off for the girls to their friends. They do not take up much space and the more you make, it shows how much your love is ( 99 means forever, a common Chinese custom belief ). 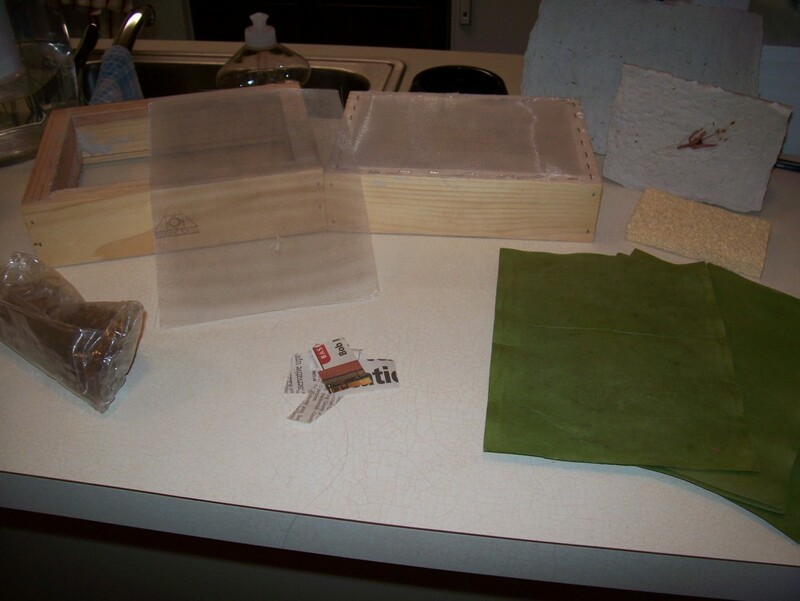 Here are the step-by-step method with photos I had taken when I made them. Don't wait anymore, give it a try. It is easy and fast. Grab your friends or family members for extra helping hands if you want to get it done before the special day arrives. 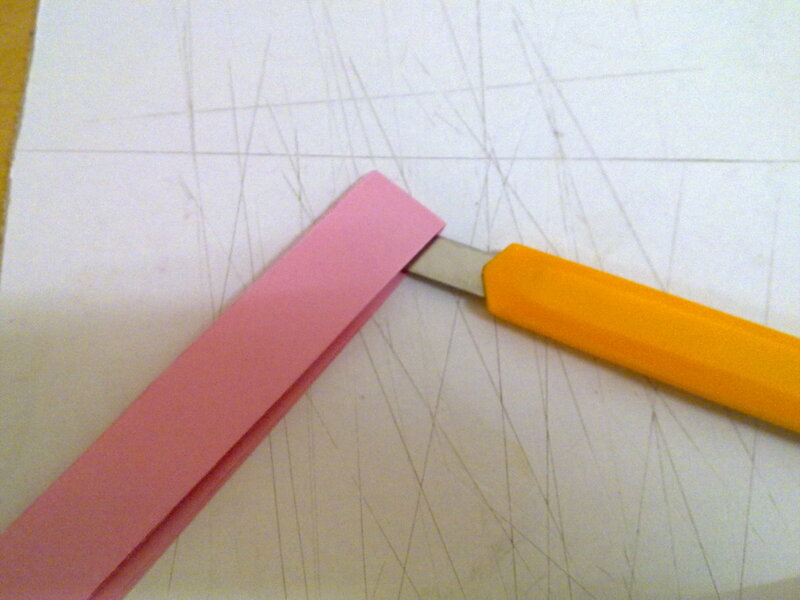 If penknife is too dangerous, use the scissors! 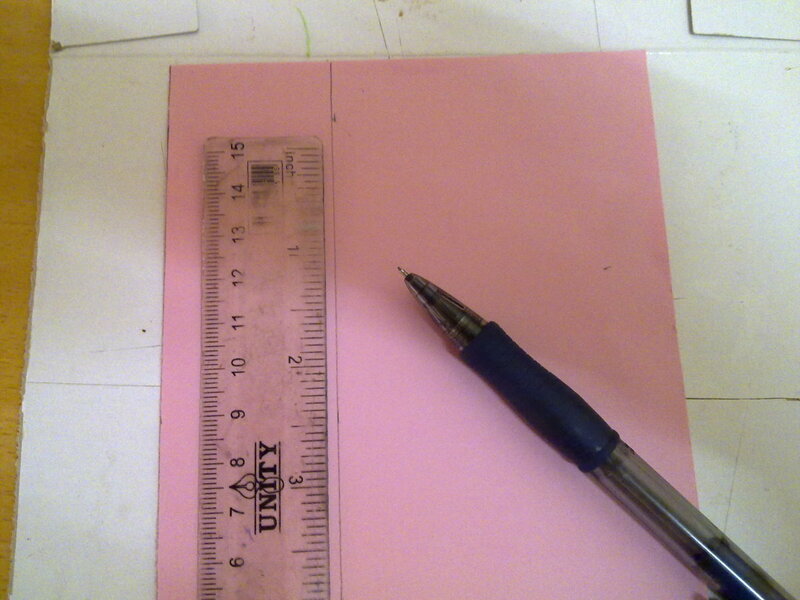 Use a ruler to measure 1.5 inch on a piece of pink paper. 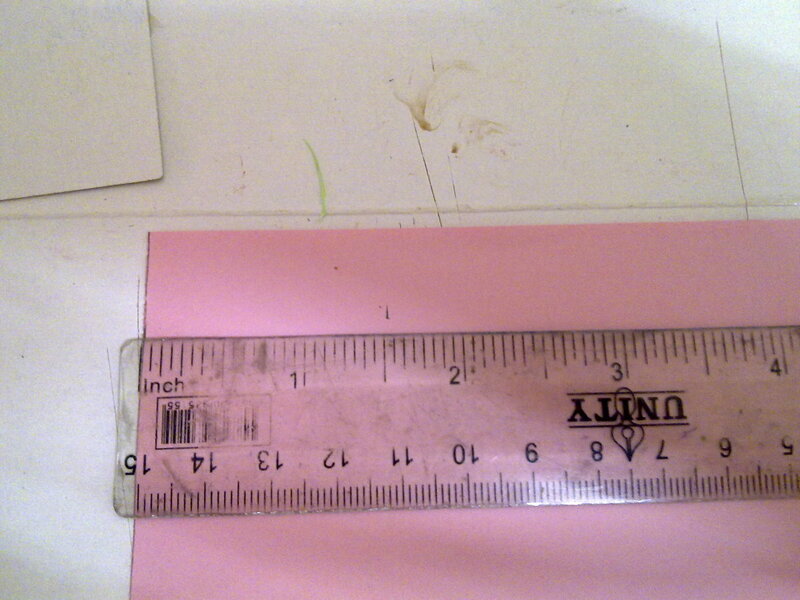 Mark it with a pencil at the top. Mark another at the middle in the same column and another at the bottom. 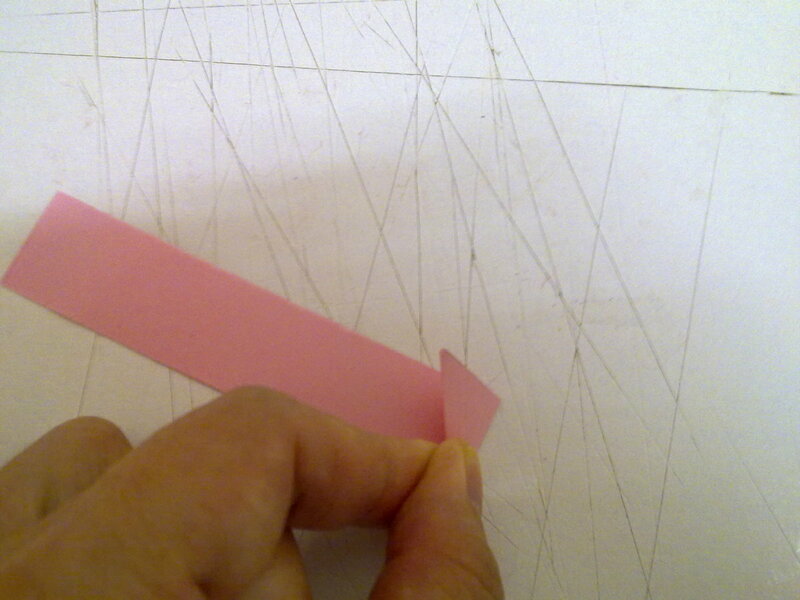 Draw a straight line from the top to the bottom, using the pencil marks as the guidelines. 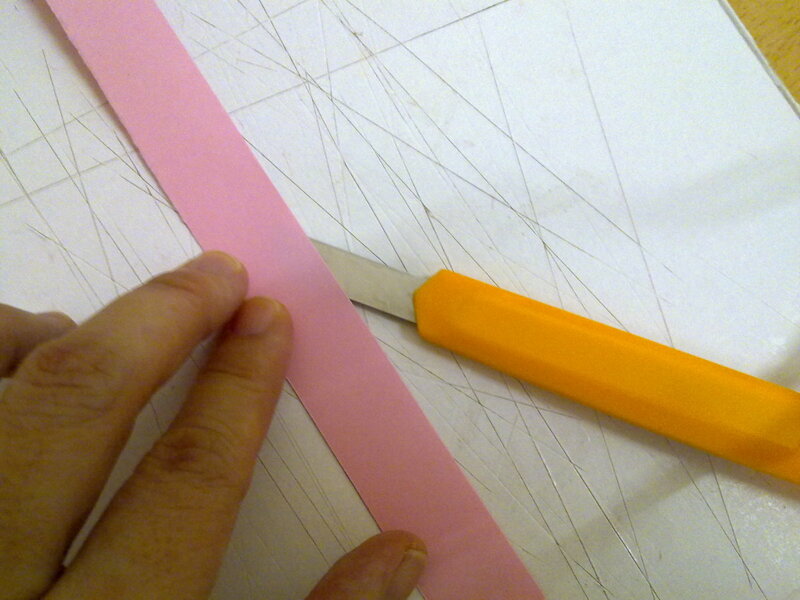 Use a penknife to cut along the drawn straight line. Tear it off. 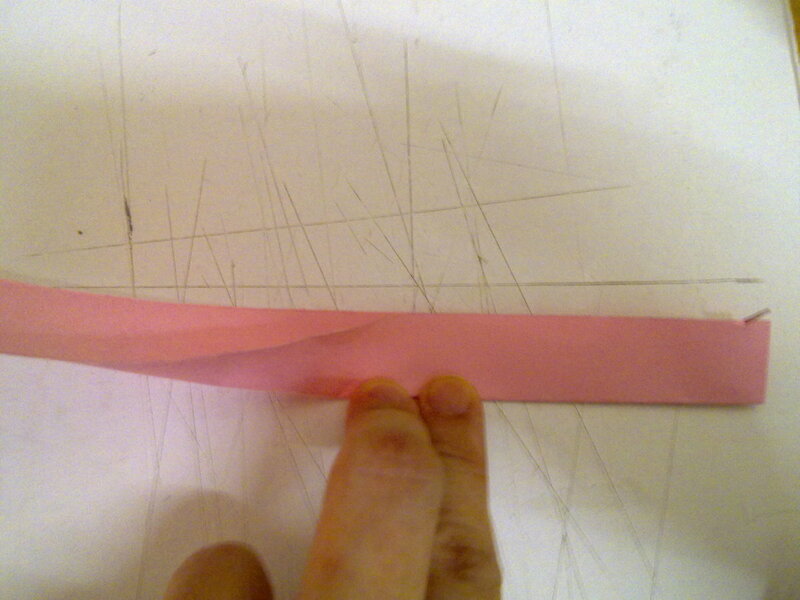 You will get one long strip of pink paper. 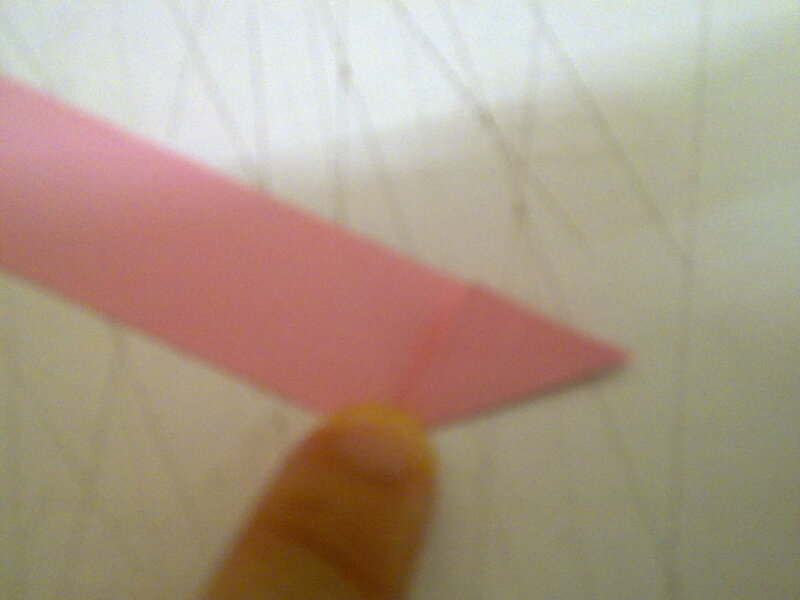 Place the strip in vertical way. Fold into half. 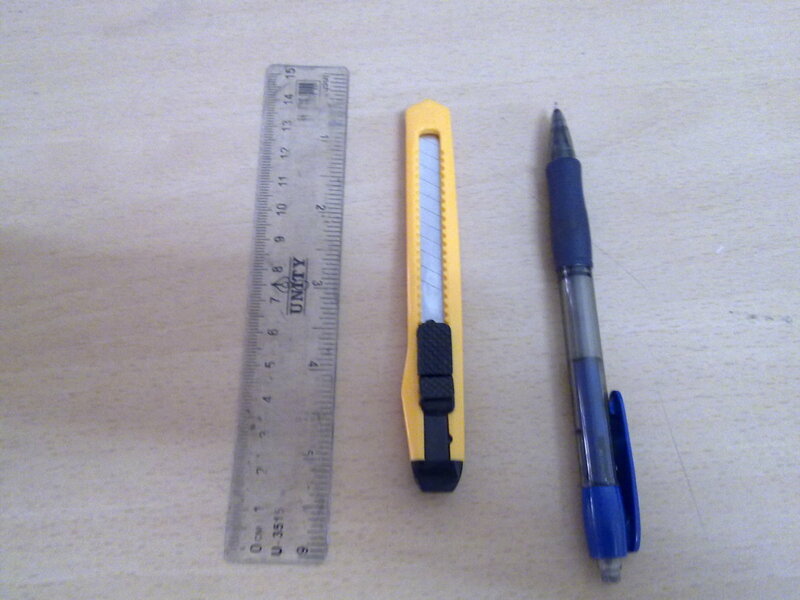 Use the penknife to cut it into half. 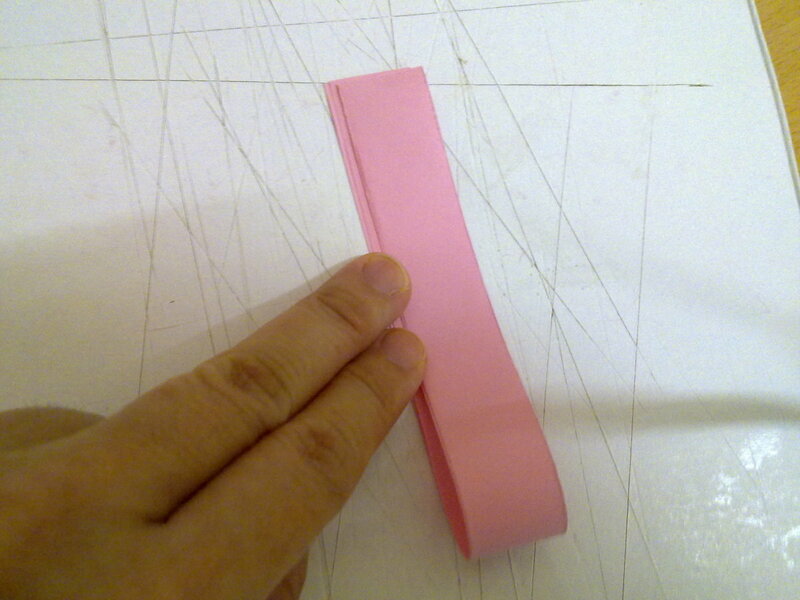 Now, you will have another 2 strips, thinner than the previous. 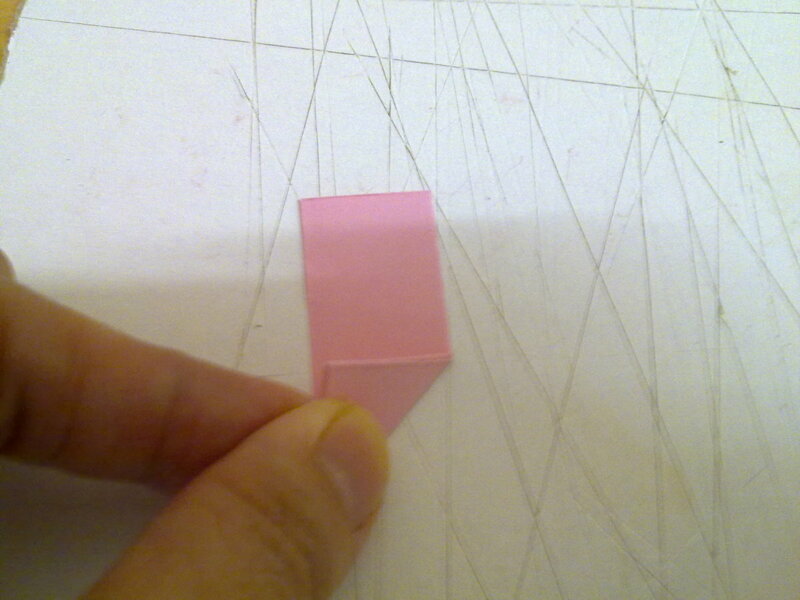 Fold the pink strip into half. Use the penknife to cut it. 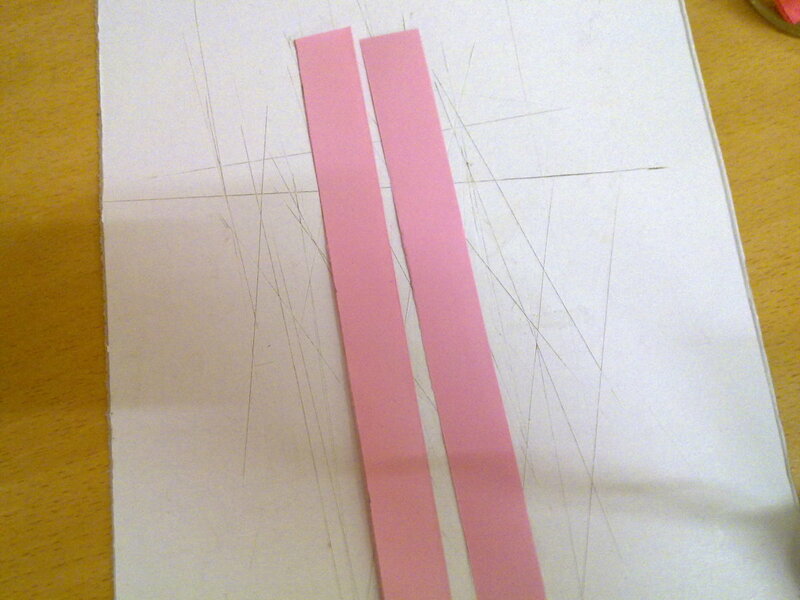 You will get 2 shorter pink strips. Take one of the shorter strips. 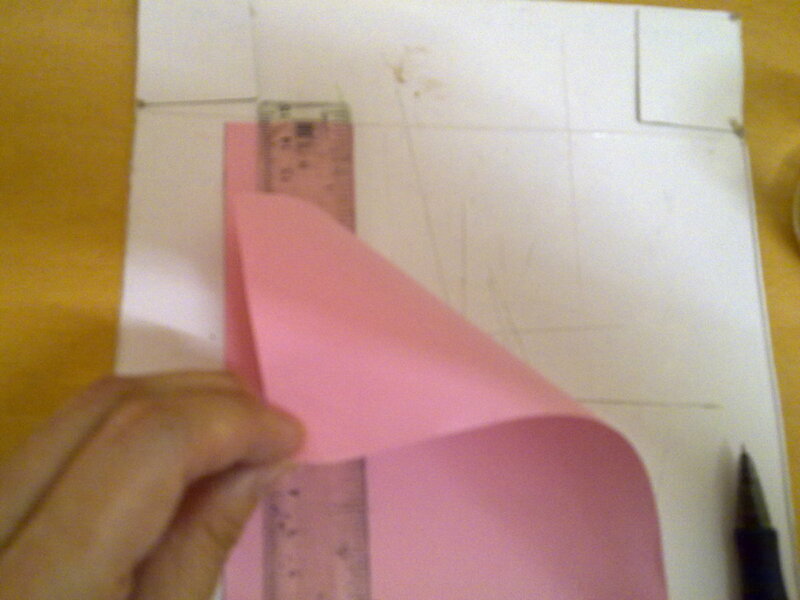 Fold it into a triangle , as photo shown. 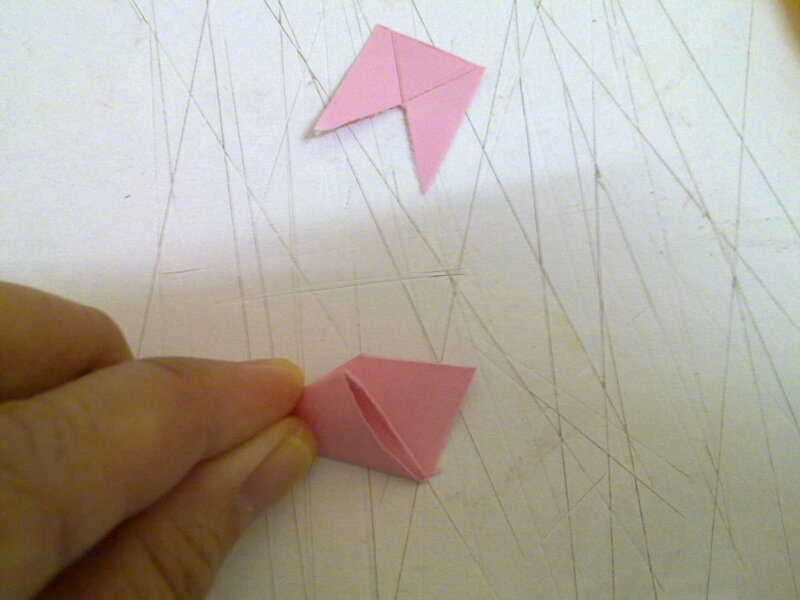 Fold up , forming another triangle and again until almost the end of the tip. 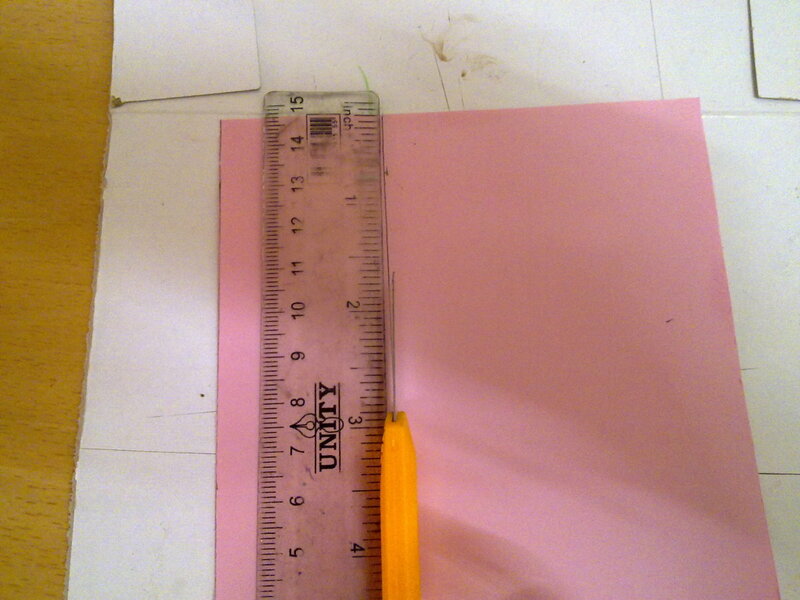 At the end of the strip, leave at least 2cm space. 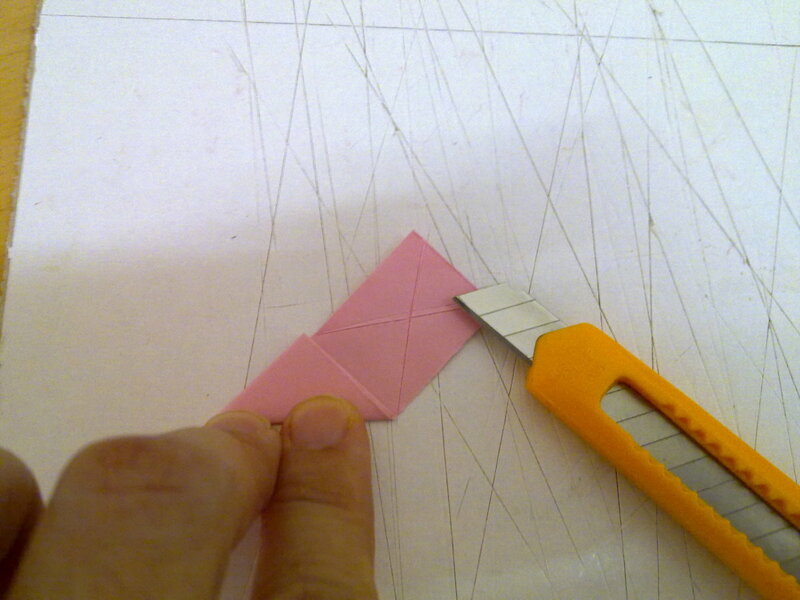 With the 2cm space left, use a sharp penknife to carve an “X”. 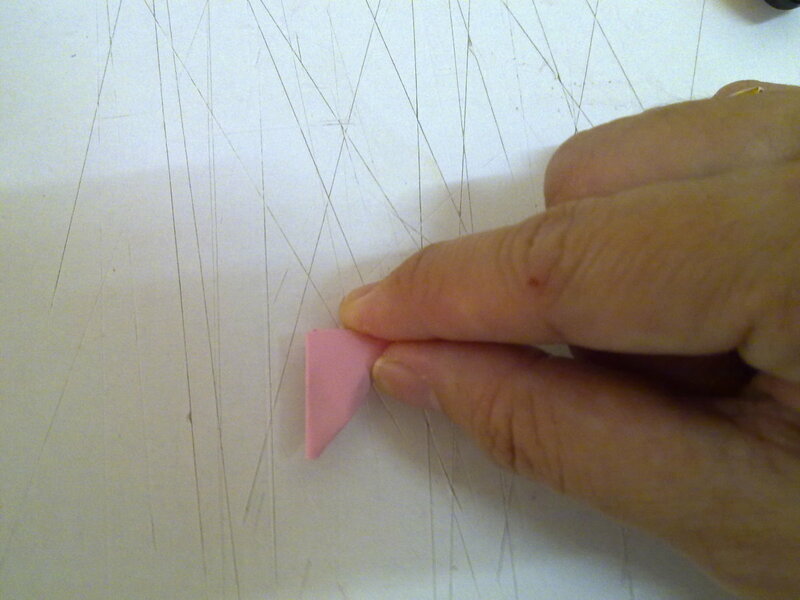 Carefully, peel off the top portion, revealing only a small triangle at the bottom. 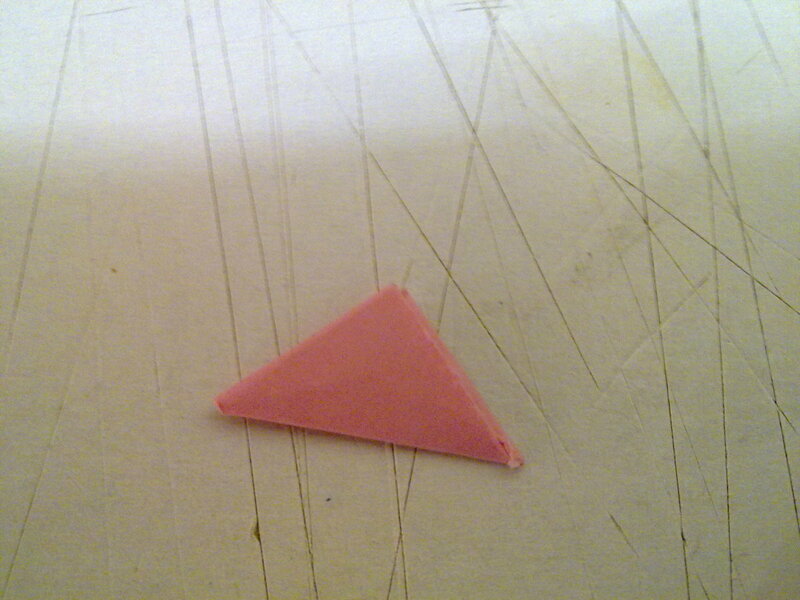 Hence, you will get a perfect triangle. 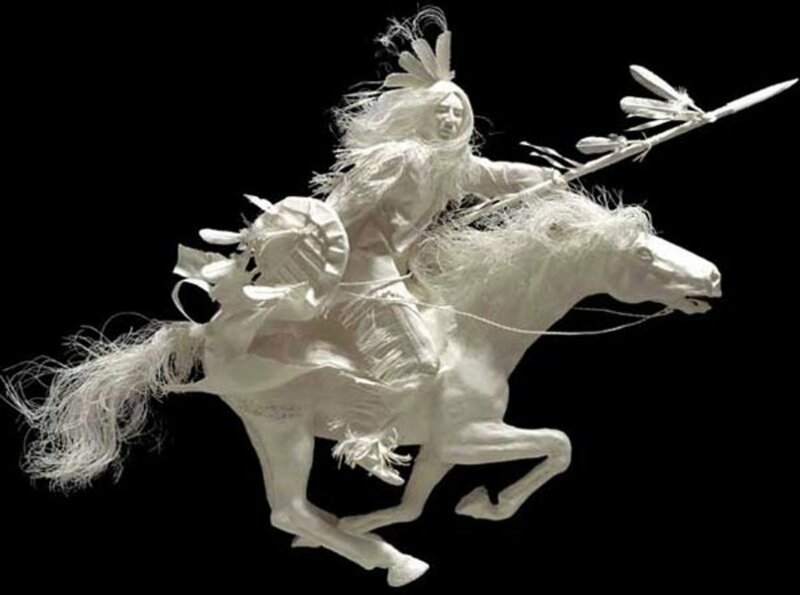 You needn’t have to use any glue at all. Just slip in the “pocket” firmly to ensure that it doesn’t come off. Then, use your thumb to push in a dent on the top of the heart. You will see a “V” shape heart. This mini heart is completed. 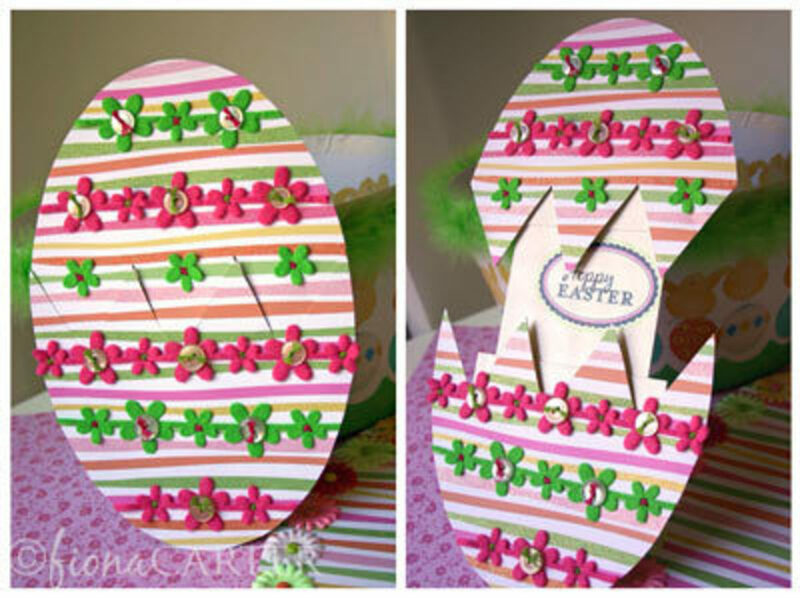 Cut out different color construction papers or gift wrappers for a change. 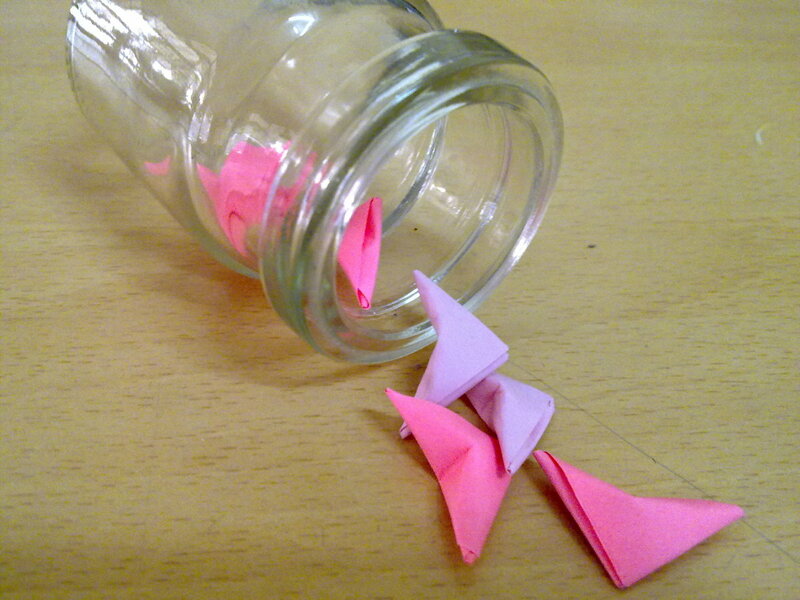 Fold as many mini paper hearts to fill up the glass bottle. A small bottle takes up approximately 30-35 pieces whereas a medium bottle takes up 70-75 pieces of hearts. Needless to say, a beer bottle could lead you to burn “Midnight Oil” in order to complete the task. Do invite your friends or siblings to help you to fold these hearts so that you could finish up the task before dinner time. Now for the finishing touch.. the GLASS BOTTLE… Actually, this is the easiest part of all. 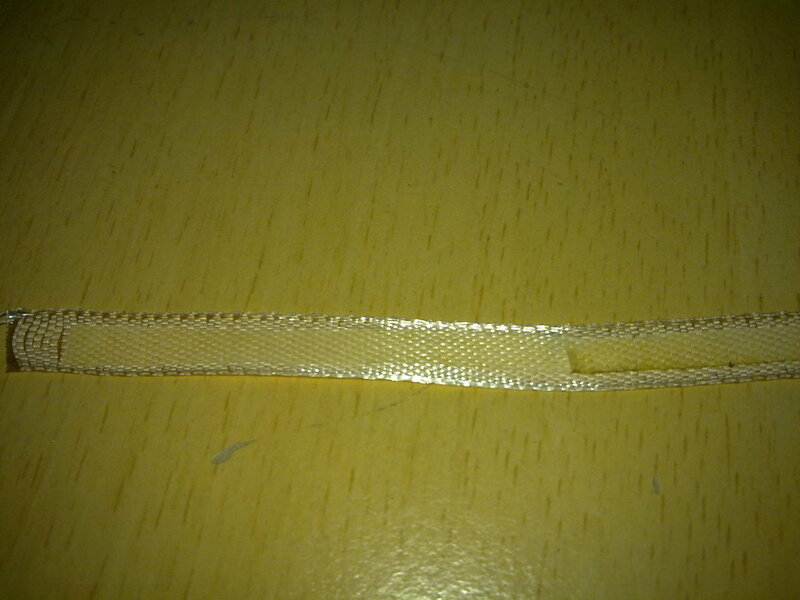 Just cut a strip of ribbon , roughly the length of the glass bottle neck and use a double-sided tape or white glue to paste the strip ribbon around the neck. You can add a bow tie or ribbon to make the bottle looks cute and charming. 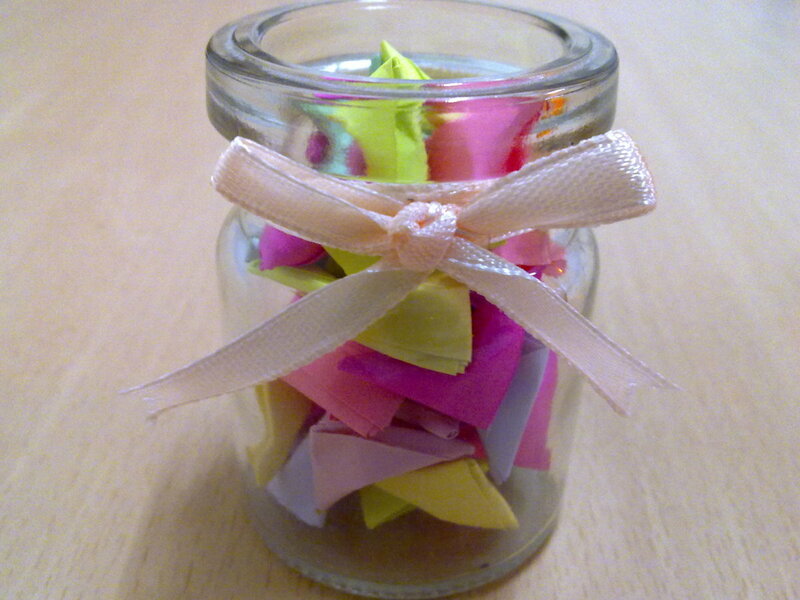 Remember to fill up the bottle with mini paper hearts of different colors. fill the bottle up with hearts. To make the special gift extra special, wrap it up with plastic gift wrapper and tie it with a bow tie. Give this special gift to your girlfriend, spouse, best friend or niece personally , accompanied with a handmade card will be GREAT ! Do you like this gift idea? Very good idea, easy to fold. Well, okay, need lots of time and extra "HANDS"
Scratching your head what to buy for Valentine's Day? Don't buy. Keep your money in your pocket instead. 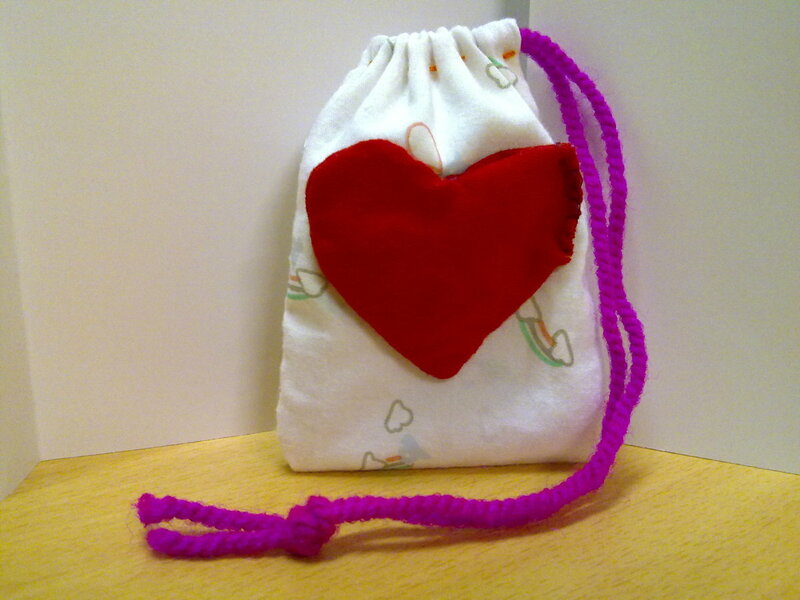 Make beautiful, simple handmade gifts for your special someone. 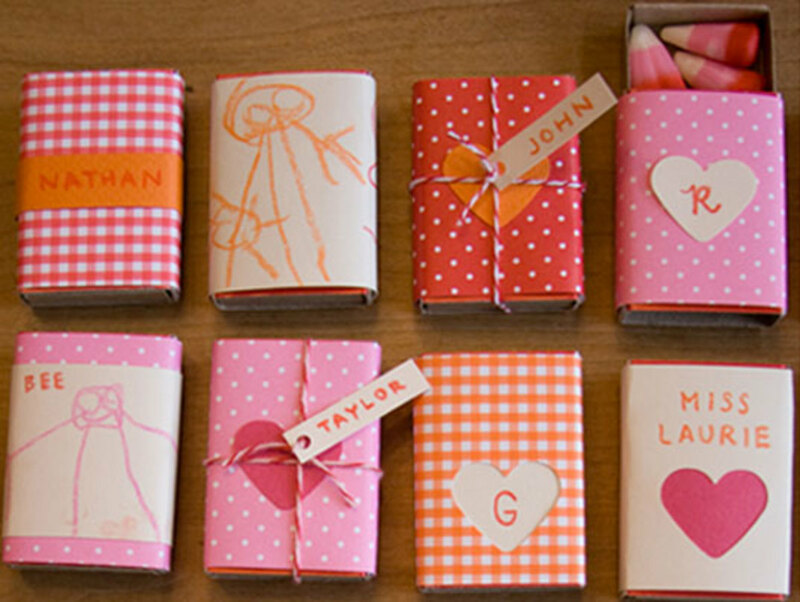 Follow these easy to make Valentine's Day gifts. Interesting article. With Valentine's Day next week, why not try making a nice bottle of hearts, that will for sure hit your lovers chest in the right place, all full of pretty hearts or better still make it a kids craft to give to their best friend. Love helps the world go round, enjoy it. thanks for yr kind comments. Hope that you will enjoy. Great project. I am voting this hub up. Fun idea. Thanks for sharing! yes, it is easy , especially for the guys. Hope that you will enjoy folding.